When Rev. Kuan Yen, the resident nun at Ding Gong Monastery in Quincy, Massachusetts, leads the chanting to Amitabha Buddha and Guanyin, the bodhisattva of compassion, she and the small group of lay members attending the weekly service hope to recite the sutras with such utter sincerity and faith that, after passing from this life, they will be reborn in Sukhavati, the Pure Land of Ultimate Bliss presided over by Amitabha. In this paradise, ten million billion Buddha Lands to the west of the earth, there is no suffering or hardship, only happiness, purity, and safety. The scenery there is spectacular, with precious stones scattered among gently rolling hills, water as sweet as nectar, and magnificent buildings where people gather to practice the Dharma. Despite the fact that people are reborn in Sukhavati carrying the full karmic weight of their actions in past lives, life there is so tranquil, they are able to devote complete attention to Buddhist practice, attaining enlightenment and breaking the karmic cycle. Amitabha and Guanyin are not only the focus of devotion for practitioners of Pure Land Buddhism, they are also exemplars for the community. Just as Amitabha, the Buddha of blissful light, made forty-eight vows aimed at alleviating the suffering and aiding the spiritual progression of all sentient beings, Pure Land Buddhists are expected to make similar vows. In fact, displaying such karuna, or compassion, is one of the primary signs that a person has gained the absolute faith necessary for rebirth in Sukhavati. Pure Land Buddhists express their compassion in many ways. One of the most basic has been to become a vegetarian, a practice expected of all who have taken the bodhisattva vows. Even those who have not yet taken the vow of strict vegetarianism gain merit through partaking in the feast that, in America, inevitably follows the weekly session of recitation every Sunday at most temples. As anyone who has sampled the delicacies prepared for these feasts can attest, maintaining a vegetarian diet is regarded as an act of compassion, not asceticism. An extension of vegetarianism is the practice of releasing animals, birds or aquatic life otherwise destined for the butcher’s block or a life of captivity. The International Buddhist Association in El Cerrito, California, for instance, has set free more than 250,000 fish, crabs, frogs, turtles, and pigeons. Pure Land Buddhists devote much of their energy to ameliorating the suffering of fellow humans. Jade Buddha Temple in Houston, Texas, frequently works with local churches to aid those displaced by natural disasters. The Buddhist Association of Wisdom and Compassion in Akron, Ohio, organizes the distribution of furniture, clothing, and money to the needy, and sponsors health fairs in which medically trained members of the participating Buddhist groups provide free medical treatment. Believing that people’s greatest suffering arises from their own undisciplined minds, many Pure Land organizations provide training in meditation not only to Buddhists, but to the general public. Hsi Lai Temple in Hacienda Heights, California, for example, sends a member of the Sangha to a nearby correctional facility and to a hospital to teach Chan practice to those recovering from substance abuse. Although meditation is often regarded as efficacious whether or not a person becomes a Buddhist, for some streams of Buddhism the overcoming of suffering ultimately requires not only right concentration, but right understanding as well. For this reason, for many the translation and dissemination of Buddhist texts is considered one of the highest expressions of compassion. 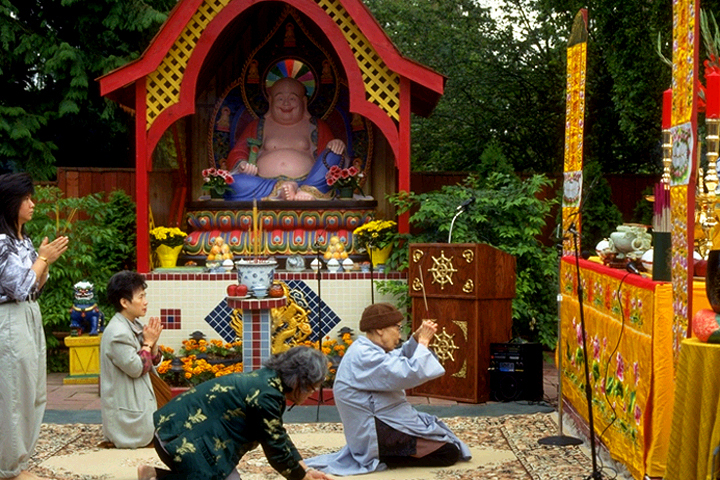 The work of the Buddhist Text Translation Institute located at the City of Ten Thousand Buddhas (near Talmage, California) and the project undertaken at Chuang Yen Monastery in Kent, New York, to store Buddhist scriptures on CD-ROM, now available for download via the Internet, are both regarded with the conviction that gaining a greater appreciation for Buddhist teaching is the most direct path to overcoming the limitations and hardships of the human condition. Ultimately, since this world is still very far from being a Pure Land, our own efforts are not sufficient to overcome the myriad sources of suffering. Liberation requires that one be reborn in a Pure Land such as Sukhavati, which can only occur through receiving the compassion of Amitabha, who from his infinite store of merit transfers the necessary amount to an individual. Not only a great Buddha like Amitabha, but anyone with a store of good deeds can transfer that merit to benefit others. Ironically, by transferring merit, a person is much more likely to receive blessings from Amitabha. When Ding Gong Monastery and other Pure Land organizations send out reminders of upcoming festivals, the notice invariably states that, through the transferal of merit, the group’s activity will benefit all sentient beings. Merit can be transferred not only to the living, but to the dead as well. For this reason, the International Buddhist Association has prayed on behalf of more than 3.5 million souls in seventy cemeteries. Whether by maintaining a vegetarian diet, freeing animals, providing disaster relief or medical care, distributing Buddhist literature, or chanting for the benefit of others, the activities of Pure Land Buddhists are geared to improve the conditions of this world so that all people can attain enlightenment. Ideally, these compassionate acts will make this world a Pure Land and obviate the need for rebirth in Sukhavati. While most Pure Land organizations have not explicitly stated the transformation of this world into a Pure Land as an aim, Master Hsing Yun, the founder of Fo Guang Buddhism, considers this both a reasonable and attainable goal. Citing the great progress humankind has made in material comfort and political rights, Master Hsing Yun sees the distinct possibility of creating a fully ethical society in the near future. By participating in this process of transformation, a person may receive from Amitabha the necessary merit for rebirth in Sukhavati. Ironically, the cumulative effects of such compassionate acts will eventually allow people to attain enlightenment without first going to Sukhavati.